What Causes Airborne Allergies, Hayfever and Allergic Rhinitis? What are the Symptoms of Allergic Rhinitis and Hayfever? What is the treatment for allergic rhinitis and hayfever? How has AllergiClear helped others? How do I use AllergiClear? With every breath we take, we breathe in millions of microscopic particles such as dust, pollen, plant spores, viruses, bacteria and even pollutants in the form of chemicals in the air. Many of these particles are filtered and removed by the nose and respiratory system, while others enter the body. If the immune system is strong and healthy, it can ward off infection against pollutants, viruses and other harmful airborne substances that may enter the body. Normally the immune system will ignore harmless airborne particles entering the body such as pollen, house dust, animal dander, etc. In some people, however, the immune system misinterprets these harmless particles and identifies them as being dangerous to the system. This triggers a release of a substance called histamine, as well as other inflammatory compounds in the body, which cause a condition called 'allergic rhinitis' and hayfever. People who develop allergic rhinitis in warm weather, wind or at spring time are generally allergic to grass, tree and flower pollens. Those who have this reaction all year round are probably also allergic to house dust, mould or animal dander. Because the mucous membranes of the nose and respiratory tract are affected, people with allergic rhinitis are often more vulnerable to colds, sinusitis, influenza and other respiratory infections, setting up a vicious cycle of compromised immune system, increased allergies, progressive fatigue and weakening of the system. Doctors usually treat allergies supportively and with antihistamine drugs which can block the release of histamine and therefore reduce or prevent the allergic reaction. Antihistamines may be short acting or long acting and come in tablets, nasal sprays, inhalers, eye drops or syrups. Many doctors suggest that their patients use antihistamines to prevent allergies (i.e. even before the symptoms appear) as well as to reduce symptoms. Good doctors will also always work together with patients on building systemic health by looking at factors like lifestyle, nutrition, diet and exercise in order to reduce allergies and maintain a healthier lifestyle. Antihistamines can be very effective and many people with severe allergies to airborne substances find it very difficult to lead a normal life without them. By preventing or reducing the allergic reaction, antihistamines can also help to prevent the illness cycle that arises due to frequent allergic attacks. However, as always, the advantages of any medication should always be weighed against its disadvantages. Antihistamines can also cause unwanted side effects and even make allergies worse in some cases. Stop Weakening Your System with Antihistamine Drugs! Some antihistamines are not recommended along with certain antibiotics or prescription antidepressants. There are many different 'natural' remedies on the market. Not all of these are as 'natural' as they claim to be, nor are all of them without their side effects. For example, many remedies contain Ephedra, also called Ma Huang - a herb which is often used to treat asthma and other respiratory conditions. Although Ephedra can be very useful in some situations, it should only be administered by a skilled practitioner. The use of Ephedra in over the counter preparations has been banned in some countries due to serious side effects which may occur. Other natural remedies may not be effective enough due to inferior formulation or failure to take a more detailed and scientific approach to the treatment of airborne allergies. Unfortunately this has meant that many people have given up on finding a healthy, natural approach to conditions like allergic rhinitis and hayfever. Because allergies involve both local reactions (release of histamine and inflammatory compounds) AND immune functioning, treatment should be holistic and aimed at treating the whole person, rather than simply suppressing symptoms. There are effective natural alternatives to the synthetic antihistamine drugs which do not come with the same side effects and which also help to support, rather than weaken systemic health. In addition, it is important to support and maintain systemic health following a healthy diet, exercising regularly and avoiding things like smoking, alcohol and other substances which could weaken your system. Do not expect medicines, whether natural or synthetic, to do all the work for you! Due to increased demand from our regular customers, we realised the need to provide an effective, yet safe alternative to the conventional treatment of allergic reactions like allergic rhinitis and hayfever. Together with experts in the field, we have developed AllergiClear - a compound remedy containing herbal, homeopathic and nutritional ingredients known for their positive effect on preventing the allergic reactions to airborne allergens and improving respiratory health. Taken regularly, AllergiClear can help you to become allergy free and reduce or even eliminate your dependence on synthetic antihistamines with their troublesome side effects. "At the age of 45, I have suffered from hayfever all my life, especially in the spring. My doctor and I have tried almost all the anti-histamines one by one which are usually effective at first and then less so as time goes by. Some years it got so bad I could not go out of the house and I always felt so unattractive with swollen and watering eyes and huge red nose! I have tried other herbs with limited success, but I was drawn to this remedy because it contained homeopathics and herbs. So far I have had far fewer symtoms with only a few mild attacks even though this is the time of year that usually really gets to me. I am going to purchase your SOS Hista Drops as advised when I spoke to your consultant." "Do you know what it is like to breathe in and smell freshly mown grass? Well I could never dare to do this or risk horrible runny nose and streaming eyes. All summer long I had to put up with sneezing, red nose and swollen eyes. I HATED it!!! Allergyclear has made a big difference to my life and I can really recommend it to anyone with an allergy to pollen and grass. Thank you for this opportunity to submit my testimonial and all your help and sympathy!" "I developed allergies in my teens to just about anything, especially house dust and animals. Antihistamines went everywhere with me, but didnt do the job completely. Without them I was a mess - with them I managed but always felt drowsy, depressed and listless. As a young man I did not even date much because I felt I could not kiss a girl when my nose was blocked and swollen and I felt unattractive. These tablets and the drops have helped more than I can say. Native Remedies products have helped every time I have used them for anything, including my allergies." Quercitin is a well known flavonoid, usually found mostly in onions and apples and is considered to be a 'building block' for other flavanoids. Flavonoids are important and powerful anti-oxidants found in fruits, vegetables and herbs and can also reduce inflammation, boost immunity, strengthen blood vessels and improve circulation. Quercitin is known for its ability to block the release of histamine, thereby preventing allergy symptoms like swollen nasal passages, congestion, sneezing, watery eyes and itchiness in eyes and nose. Other benefits include reduced risk of heart disease, stroke and cataracts, anticancer properties and the ability to promote stable blood sugar levels. AllergiClear comes in tablet form and is taken regularly to prevent Allergic Rhinitis and Hayfever and strengthen systemic functioning. 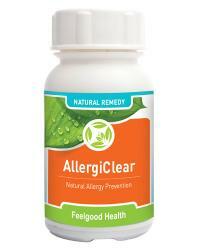 If year round allergies are experienced, use AllergiClear along with your daily supplements. If you experience seasonal allergies, begin taking AllergiClear every year just before the 'allergy season' to reduce or prevent allergic reactions to airborne allergens. Learn stress management and relaxation techniques. Stress can exacerbate allergies by weakening the immune system. Use PureCalm Drops to relax and reduce stress when needed. If you also suffer from asthma, see our BioVent Drops and Triple Complex BronchoSoothe for natural asthma relief. I developed allergies in my teens to just about anything, especially house dust and animals. Antihistamines went everywhere with me, but didnt do the job completely. Without them I was a mess - with them I managed but always felt drowsy, depressed and listless. As a young man I did not even date much because I felt I could not kiss a girl when my nose was blocked and swollen and I felt unattractive. These tablets and the drops have helped more than I can say. Native Remedies products have helped every time I have used them for anything, including my allergies. Do you know what it is like to breathe in and smell freshly mown grass? Well I could never dare to do this or risk horrible runny nose and streaming eyes. All summer long I had to put up with sneezing, red nose and swollen eyes. I HATED it!!! Allergyclear has made a big difference to my life and I can really recommend it to anyone with an allergy to pollen and grass. Thank you for this opportunity to submit my testimonial and all your help and sympathy! At the age of 45, I have suffered from hayfever all my life, especially in the spring. My doctor and I have tried almost all the anti-histamines one by one which are usually effective at first and then less so as time goes by. Some years it got so bad I could not go out of the house and I always felt so unattractive with swollen and watering eyes and huge red nose! I have tried other herbs with limited success, but I was drawn to this remedy because it contained homeopathics and herbs. So far I have had far fewer symtoms with only a few mild attacks even though this is the time of year that usually really gets to me. I am going to purchase your SOS Hista Drops as advised when I spoke to your consultant. Clear stubborn mucous plus long term allergy support! Allergy power-pack to soothe immediate symptoms while building up a resistance! For immediate symptomatic relief of allergies plus ongoing long term allergy support!